CHICAGO — The city has boosted its network of surveillance cameras to what the American Civil Liberties Union called a "frightening number" under Mayor Rahm Emanuel, but their use will likely increase in the wake of the Boston Marathon bombings after the use of cameras in that investigation. 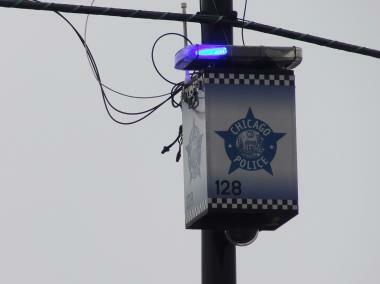 The city has added 500 security cameras under Emanuel and now has a "federated system" of 22,000 cameras citywide, said Gary Schenkel, executive director of the Office of Emergency Management and Communications. The system includes the so-called blue-light street cameras, but also cameras on CTA trains, buses, public transit stations, CHA facilities and ones operated by other public bodies, Schenkel said. 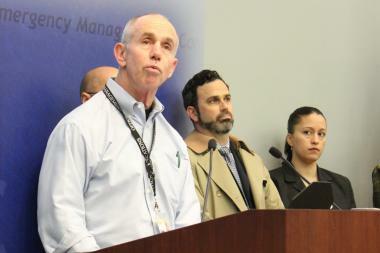 Emergency Management Executive Director Gary Schenkel said the city has added 500 surveillance cameras under the Emanuel administration. In addition to the 500 city-owned cameras added under Emanuel, the CTA added 1,700 cameras in 2011, and Chicago Public Schools have added or plan to add hundreds more, according to a recent report by the ACLU of Illinois. The city also has gained access to private networks operated by the Board of Trade and Federal Reserve. The 22,000 total is up from an estimated 10,000 the city had access to in February 2011, the ACLU report said. "Twenty-plus-thousand cameras that are owned by the City of Chicago is a frightening number," said Adam Schwartz, senior staff counsel at the ACLU of Illinois, who wrote the report. "Whatever else they are, these cameras are a menace to our privacy." Nevertheless, their use is likely to expand nationally, given the apparent success of the Boston bombing investigation. "A lot of cities are looking to invest in surveillance technology or expand on it," said Nancy La Vigne, director of the Justice Policy Center at the Urban Institute, a nonpartisan think tank based in Washington, D.C.
How much cameras can assist in reducing crime in the city's neighborhoods is hard to determine, however. The ACLU's report notes that cameras have contributed to less than 1 percent of arrests. A 2011 study of surveillance cameras co-authored by La Vigne showed that crime did slow in Humboldt Park with an influx of cameras, although the results were less dramatic in Garfield Park because fewer cameras were monitored less regularly by the Chicago Police Department. "They were nonetheless cost-beneficial," La Vigne said, with an estimated return on investment in reduced justice and crime enforcement costs of $4.30 for every dollar spent on surveillance cameras in the two neighborhoods. Schenkel said he's consulted that study to come up with a "gap analysis" of "high-priority areas" the city worked to concentrate new cameras on, although he was quick to limit expectations. "Cameras have a tendency to lead people to believe they're the panacea for all crime and activity reporting," he said. "I think they're a contribution" to the recent reduction in murders, he added. "They're another tool in the toolbox for public safety in general. I don't think anyone would ever say this is an absolute crime stopper." Schwartz agreed that cameras are "not a cure-all for the safety issues we see in society. We have privacy concerns. We think that when people go about their lives in public, they expect that the government is not keeping track of where they're going and what they're doing." Schenkel insists that those monitoring the cameras are well-versed in the First and Fourth amendments, but that's not good enough for Schwartz and the ACLU, who point out "there's a history in Chicago" of surveillance methods being turned on protesters and others in opposition to the government. "What we want is a rule that prevents that sort of thing from happening," Schwartz said. "It is critical that appropriate safeguards be put in place for these cameras and that there be a lot of transparency." The ACLU study, "Chicago's Video Surveillance Cameras: A Pervasive and Poorly Regulated Threat to Our Privacy," which was published in a Northwestern academic journal, lays the foundation for restrictions on their use. "We believe there ought to be written, binding rules that limit the use of these cameras," Schwartz said. The ACLU seeks to impose legal demands for probable cause and reasonable suspicion in their use, as well as limits on how long footage can be retained and how it can be distributed to other government agencies for investigations. It would also like to see the number and location of cameras officially published, along with an annual report on their use. The City Council, however, has thus far been unresponsive to ACLU calls for more oversight. The cameras are even more in the public spotlight after the Boston bombings, just as they were after Sept. 11, 2001, which should trigger additional growth, La Vigne said. "We can expect the same this go-round," she added. La Vigne discussed the renewed emphasis on surveillance cameras and Mayor Emanuel's endorsement of them in a recent blog post. She drew attention to how much of the key video evidence of the bombing suspects came from private security cameras. "It raises the question of whether there should be better public-private partnerships and sharing surveillance capabilities and footage, and the obvious answer would be absolutely," La Vigne said. "As I understand it, Chicago is partnering with private businesses quite a bit." Schenkel confirmed that, saying, "That program has expanded exponentially," beginning with preparation for the NATO summit a year ago, although he declined to go into detail on the actual number of additional cameras the city can draw on, saying it was "law-enforcement sensitive." Still, that only augments the "federated system" that is the basis for surveillance cameras. That only raised more privacy concerns for Schwartz and the ACLU. Schenkel echoed Emanuel's demand that the city update its entire security system based on the "after-action reports" that come out of Boston and added that process is already under way. "We're in good shape, I think, but there's always room for improvement," Schenkel said. "We try to stay on top of whatever the anticipated problems are." The ACLU, however, saw room for improvement in privacy and transparency.